Harry Green. BTO Regional Representative for Worcestershire. Fieldwork for the next BTO/BirdWatch Ireland/Scottish Ornithologists Club Atlas started at the beginning of November 2007 and will continue for four years: 2007-2011. The data is being collected and collated at the BTO. The last Atlas of Breeding Birds was based on fieldwork 1988-1991, and the first on fieldwork between 1968 and 1972. Data for an Atlas of Winter Birds was collected between 1st November 1981 and the end Feb 1984. Between them these Atlases have charted some notable changes in the distribution and numbers of birds occurring in Great Britain and Ireland. The current Atlas is the first attempt to combine fieldwork for both summer breeding birds and wintering birds during the same period of years. The surveys, both winter and summer, are in two main parts. One is to find all the species using 10x10km square in the British Isles during the survey periods and in summer to determine breeding status. The second is to make rough estimates of the numbers of each species based on sample counts made during Timed Tetrad Visits (TTVs). Tetrads are 2x2km squares and there are 25 in each 10x10km square. The aim is to survey a minimum of eight tetrads, winter and summer, in every 10x10 km square (there are obvious exceptions in, for example, coastal squares). The field work therefore consists of collecting Roving Records throughout the four years of the survey to build up the 10x10km square lists, and undertaking TTVs. Once the TTVs have been made, winter and summer, recording for that tetrad is complete and is not repeated. Hopefully observers will move on to new tetrads. Roving Records for any tetrad through the Atlas period are of course important. Early and late visits are required both winter and summer to complete coverage of a tetrad. The two winter periods are from 1st November to 31st December, and from 1st January to last day of February. The two summer visits are between 1st April and 31st May, and between 1st June and 31st July. It is best if the two visits in both periods are at least two weeks apart. Unlike the previous Atlases the new one is making very great use of the internet enabling observers to obtain information and to submit results on-line. This is a very great step forward enabling millions of records to processed very rapidly. Observers can of course send in records on paper and these will be entered on to the database at BTO. The findings of other BTO surveys are also being incorporated into the Atlas database. These include, for example, Garden Bird Watch, the Breeding Birds Survey, and BirdTrack, and data from other specialist surveys. If you would like to help with the Atlas in Worcestershire please contact me. An easy way to get involved is via the web site www.birdatlas.net. You can reach the same point via the BTO web site. From the site you can view and download information. You can also select a tetrad as yet uncovered by anyone else and register your interest. This information is sent to me and I can then allocate the tetrad to you and send you the relevant paperwork. After your fieldwork you can easily enter your records on-line or if you wish send them to me on the forms provided. The paperwork explains very clearly the details and methods of the survey. In Worcestershire I cover 18 10x10km squares. Some of these overlap neighbouring counties and I cover those areas as well. Similarly adjacent counties cover some parts of Worcestershire – the BTO works on square boundaries for these surveys! That gives a total of 450 tetrads for Worcestershire. So far 153 have been allocated which is much better that it appears as ten 10x10km squares already have over eight tetrads allocated. Nevertheless there is a lot more work to do. Poorly covered 10x10km squares at mid-December 2007 are SO97, SO66, SO96, SO85, SO83, SP05, SP04. Volunteers welcome! Obviously it is becoming too late to do start new tetrads for the winter 2007-2008 (the two visits need to be in the same winter or summer). However you can start with the summer 2008 and follow on with the winter 2008-2009. It is best though not essential to undertake the winter and summer surveys in sequence. It is certainly never too late to start collecting Roving Records which can be collected anywhere at any time, and entered on to the web site or on the paper forms. Where possible these records are designated to a tetrad and they need to be dated. I think the results from this Atlas will be amazing! The use of the internet and modern computing will enable processing of very large numbers of records very quickly. The publication date is currently scheduled for 2014 – the year of my 80th birthday! I can’t help wondering if I shall be around to see it! It is also pretty sobering thought to realise I have been personally involved in organising, collecting, and collating data from Worcestershire for this and all the previous Atlases. Please contact me for further information. harrygreen_worcs@yahoo.co.uk, or 01386 710377 or Windy Ridge, Pershore Road, Little Comberton, Pershore, Worcs., WR10 3EW. The page below shows facsimile the BTO’s Introduction to the survey. BTO Worcestershire is shown by the heavy line below. The outer boundary indicates Greater Worcestershire - the modern county plus VC37. The dotted outlines are district boundaries. Bird Atlas 2007-11 aims to produce maps of distribution and relative abundance for all bird species breeding and wintering in Britain and Ireland. It will allow us to assess changes in bird distributions since previous breeding atlases in 1970 and 1990, and since the last winter atlas of the early 1980s. Atlases have been immensely important for furthering bird knowledge and conservation and Bird Atlas 2007-11 is destined to set the agenda for the next decades of ornithology in Britain and Ireland. Read on to help make the Bird Atlas a success. Roving Records - whatever you see, whenever, wherever! For distribution maps to be comprehensive we need complete species lists for every 10-km square in Britain and Ireland for the breeding season and winter. 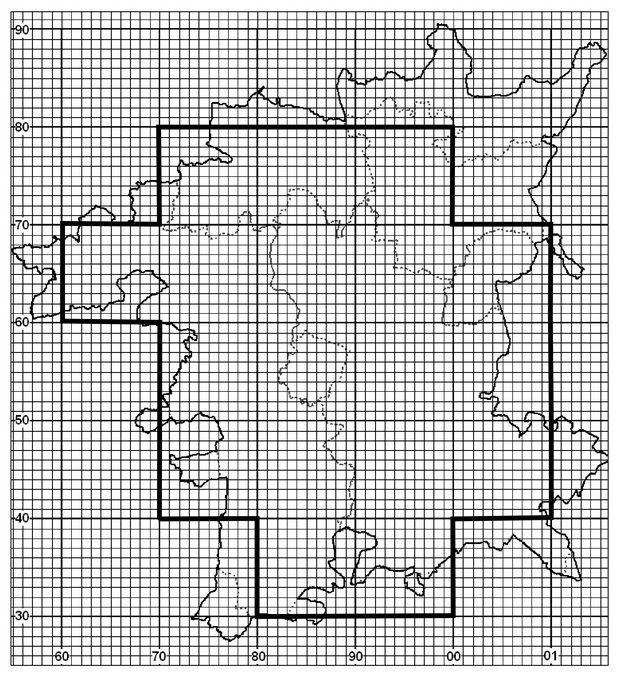 Roving Records are a means of submitting lists for grid squares, one-off records of hard to find species, and anything in between. They are also a means of accumulating evidence of breeding and for providing records of nocturnal species. Everyone can take part by supplying Roving Records. Timed Tetrad Visits (TTVs) are principally concerned with discovering the broad patterns of relative abundance across Britain & Ireland by counting birds for fixed periods in tetrads. Tetrads are 2km x 2km squares and labelled A to Z within each 10-km square as shown (above). TTVs do not aim to produce a complete species list for the tetrad, but a sample of what one can find during a pair of visits (one early, one late) in winter and/or breeding season We aim to cumulatively cover at least eight tetrads in every 10-km square in Britain and Ireland during winter and the breeding season. You can take on as many tetrads as you wish. This is a great opportunity to visit those hidden corners of the landscape and find new birds and follow the seasonal changes. Anyone and everyone can take part by completing Roving Records forms. These are available from your Regional Organiser, from BTO HQ and can be printed off directly from the website (www.birdatlas.net). If you'd like to take on one or more tetrads for Timed Tetrad Visits please contact your Regional Organiser who will be coordinating coverage. If you do not know your RO, either visit the website (www.birdatlas.net), or speak to BTO HQ. The Bird Atlas is a huge project and we anticipate millions of individual bird records. We have developed a dedicated online system to allow you to see where the gaps are - you can see which tetrads are available or, for example, look at the distribution for a range of species. So please submit your data directly online. Register at www.birdatlas.net. Bird Atlas 2007-11 is a partnership between the British Trust for Ornithology (BTO), BirdWatch Ireland (BWI) and the Scottish Ornithologists' Club (SOC).